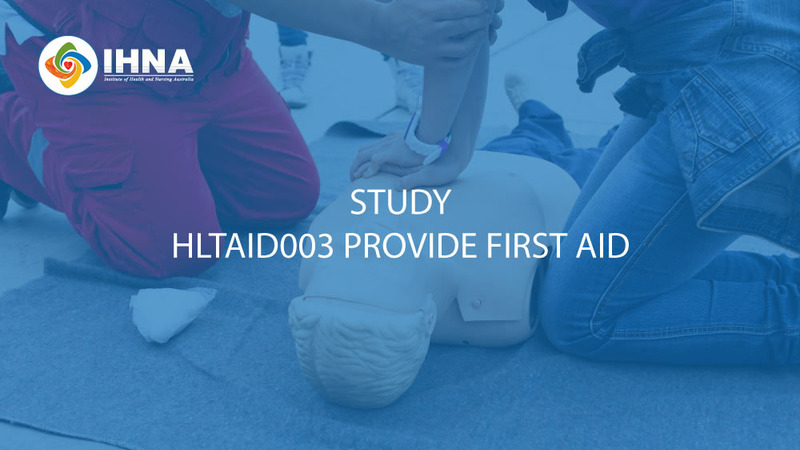 The skills learnt in IHNA’s 'HLTAID003 - Provide First Aid' course will enable you to respond effectively in emergency situations. Many occupations and voluntary organizations require a First Aid Certificate. Unlike most first aid course providers, IHNA first aid training is not just taught by first aiders but by experienced healthcare professionals with extensive experience treating patients in clinical and emergency settings. IHNA trainers teach with genuine experience and insight. Benefit from their experience and knowledge to gain genuine first aid ability, not just a certificate. As well as fulfilling a legal obligation, a well-trained first aid officer helps provide peace of mind in the event of workplace injuries or emergencies. Correct and prompt application of first aid procedures reduces the risk of legal liability and helps keep insurance premiums low across your industry sector. Your employees are your organisation's most valuable resource and you may even require first aid yourself one day. IHNA teaches first aid as part of many more extensive courses, leading to synergies that reduce the cost to training participants and their employers. This keeps IHNA first aid training costs low in comparison with other training providers. To keep your first aid current, it is important that first aiders undertake the half day CPR training (HLTAID001) every 12 months. All theory is to be completed online or face to face before the practical session. Students may use the institute facilities if necessary to do the online theory. The course also requires a one day practical session which must be completed at the institute. It is important that you attend the theory and practical session of this course so that you are eligible to receive a Statement of Attainment. Your Nationally Recognized Statement of Attainment has been accredited by the ASQA. Your certificate will be valid for 3 years and the Australian Resuscitation Council recommends that you attend a cardio pulmonary resuscitation(CPR) update every 12 months. You can book in for the sessions by clicking 'Book Now' button. Please Note: You will be required to complete an E-Learning Assessment by the night before you come into face to face training. IHNA reserves the right to cancel/reschedule the intake if sufficient enrolment numbers are not there for the intake. In the event of a cancellation or reschedule, full fee paid by the student will be refunded or the student can attend the rescheduled session. Student can cancel the enrolment three days before the course start date and the full fee paid by the student will be refunded. Fee is not refundable if the student withdraws from the course within two days of the course start date. That is if the course is starting on 24th of the month, the student can cancel the course till 21st with full fee refund. Cancellations happening on 22nd and 23rd will not be eligible for fee refund.